Yarn: Cotton-ease (50% cotton, 50% acrylic), 1 x 100g skein (207 yds) of main color (MC) and scrap amounts of contrast color (CC). I used bubblegum pink (discontinued) and white. Finished Measurements: Width 20", Length from shoulder to hem 12-1/2"
Notes: SM="slip marker," RM="remove marker". The sleeves are designed to have just a tiny bit of puffiness to them. In addition to being used for the duplicate stitching, the contrast color is used to add a bit of interest to the collar, sleeve, and hem, but this is completely optional. With MC, CO 12 sts, PM (back R shoulder), CO 14 sts, PM (front R shoulder), CO 24 sts, PM (front L shoulder), CO 14 sts, PM (back L shoulder), CO 12 sts (76 sts total). Leave long tail to work crochet for button loop. Row 17: join to knit in the round, PM to indicate start of round. Cont to inc 1 stitch before and after each marker every other round, a total of 9 times, until there are 148 sts total (32 for each shoulder, 42 for each front and back). Cont in stockinette till work measures 10-1/2”. *K 1 round in CC. P 1 round in MC. Repeat from * 1 time. K 1 round in MC. BO. Finishing: Single-crochet button loop in back. Sew on button. Weave in all ends. This is sooooo cute!1 I have to make one. This is awesome! I am so adding this to my list for my daughter. I have been using a Mac since 1986 and own 2 ipods. 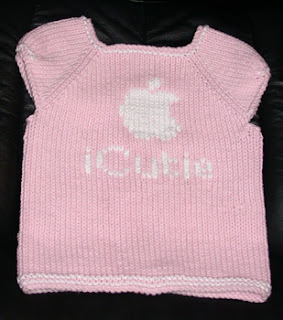 Can't wait to make on for my granddaughter! Groan, I can see me on the street, pretty pink iCutie in hand, looking for a little girl . . . and I already have the reputation for strangeness in town! You are bad! Lovely design, I can't wait to see your future endeavors. OH wow!! This is adorable!! Thank you so much for sharing the patter with all of us! Hi there! I am in the process of making this pattern which is SUPER cute! This is my first project that's not a simple hat, gloves, scarf so I'm a bit confused. If I'm figuring right, once you start increasing, you're adding 8 stitches for every row/round. If you increase every odd row, then you're adding 8 sts on the 5,7,9,11,13 and 15 rows. You end up with 124 sts. 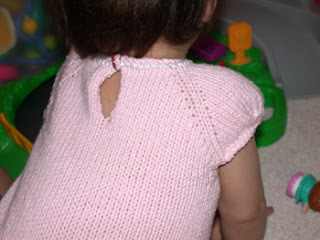 Then it says to join on 17 and knit, alternating increase rows 9 times for a total of 148 sts. Here's where I can't get my math to make sense. Do you start increasing on row 17 (increasing 8 sts on 17, 19, 21, 23, 25)? that would give you 164 sts. Do you start on row 18 (inc. on row 18, 20, 22, 24)? That would give you 156 sts. If you start on row 19 (inc. on row 19, 21, 23, 25), you'd still have 156 sts. Am I figuring this wrong? Or should I just make sure that I increase to 148 sts no matter where I do it? Do you know much much I would have to decrease things if I was looking to make a smaller size? Like 6 moths? Hi, Anonymous. I'm sorry, but I'm really not sure. Part of why I never resized this pattern is because I'm really not sure what size kids' clothes are supposed to be and didn't know at the time how to grade pattern sizes. Hi, I really liked this pattern very much. I m newbie in knitting. When i increase before and after the marker, i m getting a visible hole. Please tell me which method have you used to do the increases. am halfway thru so far. LOVE it! thnx for sharing. Very sweet tee. Thank you so much for sharing.